I was invited to experience a weekend in Hershey by the Hershey Entertainment & Resorts Company. All opinions are my own. Today, I’m recreating a drink I had at Hershey’s Fire & Grain Restaurant during my Sweet Welcome Weekend. If you love grapefruit, this Danny Ocean Cocktail Recipe is for you. I’ve never watched any of the Ocean’s films but I do know Danny Ocean is the main character. It wasn’t the name, Danny Ocean, that drew me to this cocktail when pursuing the menu at Fire & Grain at the Hershey Lodge. It was the ingredients. I have been a on grapefruit kick lately. Most of the cocktails I’ve been ordering when dining/drinking out have had grapefruit juice as a main ingredient. While pursuing the cocktail menu at Fire & Grain I ordered the Danny Ocean cocktail. With my first sip I knew I had to recreate this Danny Ocean Cocktail Recipe on the blog. Fire & Grain, is a fun, welcoming restaurant located in the lobby of the Hershey Lodge. The dining room features gathering tables, a fire wall, and a full service bar. Fire & Grain is open for breakfast and dinner and its menu has an incredible assortment of comfort foods bites and dishes and creative cocktails. Fire & Grain is the perfect spot for breakfast with your family, dinner with friends, or cocktails with co-workers. We gathered here on the first night of my Sweet Welcome Weekend 2018 for a nightcap and small bites. Here were some of my favorites from Fire & Grain. I’m a sucker for deviled eggs. We all decided to order and assortment of Shareables and Flatbreads for our table. I had to try the Deviled Egg Trio, a Smoked Salmon & Chive Sour Cream, Bacon & Horseradish and Pickled Beet Deviled Egg. Each and every egg was delicious and I couldn’t decide which was my favorite. 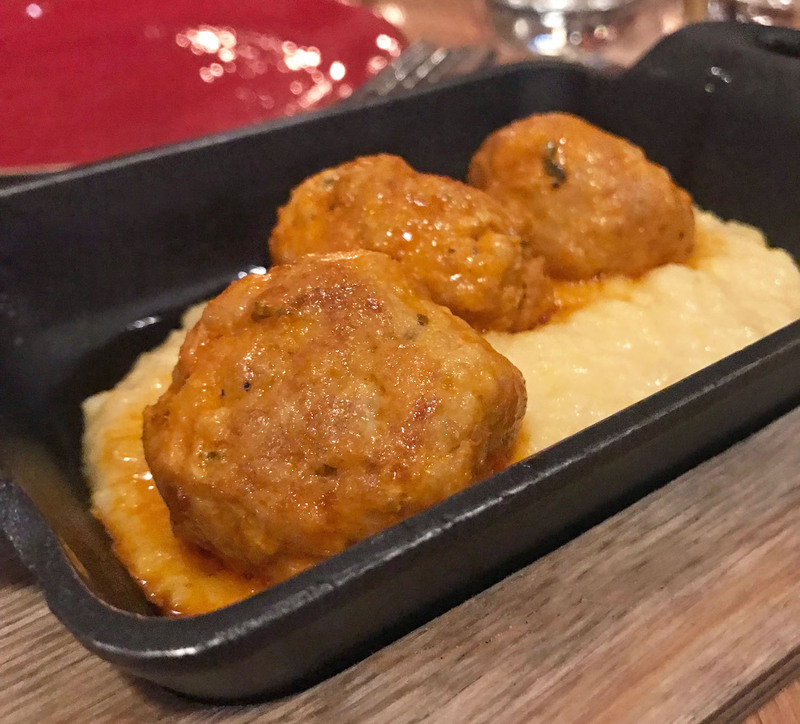 I also had a bite of these Buffalo Chicken Meatballs. For dessert I ordered the Monkey Bread but once I saw the S’Mores Jar, I had immediate dessert envy. To go along with my dessert I had to try the signature Hershey’s Chocolate Carmel Martini. The dining experience at Fire & Grain was one of my favorites from the Sweet Welcome Weekend 2018. I also really enjoyed eating breakfast at the Hershey Grill (at The Hershey Lodge), breakfast at The Circular (at The Hotel Hershey) and lunch at Devon Seafood. All are dining must-haves when visiting Hershey, PA. The Danny Ocean Cocktail Recipe comes together in minutes but is filled with flavor and a slight kick from the tequila, making it the perfect cocktail to sip at the bar or by the fire. To begin, I combined the ingredients into a cocktail shaker. I filled an old-fashioned glass with crushed ice and poured the drink over the ice. To finish, I garnished with a grapefruit slice. A nice grapefruit and tequila cocktail. Shake well. Strain into an old-fashioned glass filled with ice. I will definitely be making this delicious cocktail again. What a treat!